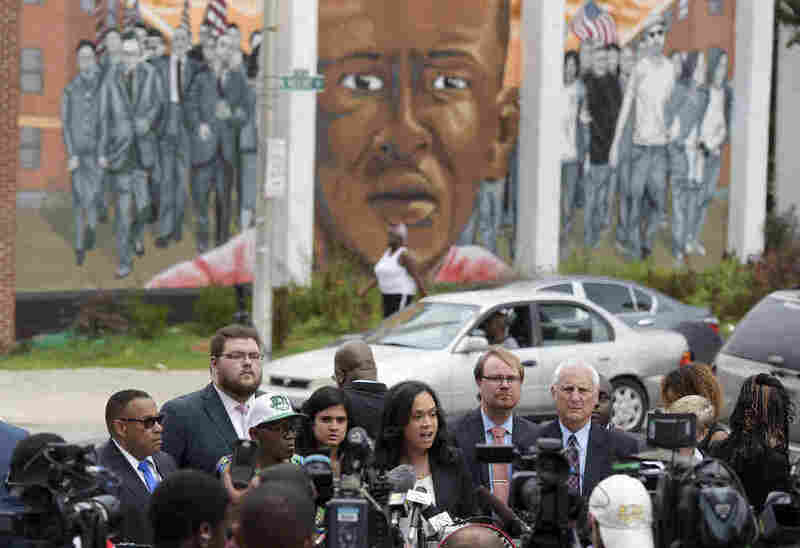 WATCH: Marilyn Mosby: 'The System Is In Need Of Reform' : The Two-Way The Baltimore state's attorney has dropped all remaining charges related to the death of Freddie Gray, but she says she stands by the legitimacy of the criminal charges. Baltimore State's Attorney Marilyn Mosby, center, speaks during a news conference Wednesday after her office dropped remaining charges against the three Baltimore police officers who were still awaiting trial in Freddie Gray' death. Third from left, in a cap, is Freddie Gray's father, Richard Shipley. Baltimore State's Attorney Marilyn Mosby has dropped the remaining criminal charges connected to Freddie Gray's death but she stands by the legitimacy of the original charges. At a news conference near the site of Gray's 2015 arrest, Mosby defended her office's decisions in the case, and denounced individual police officers for not cooperating with the investigation into Gray's death. Gray died in 2015, a week after he was arrested by police, handcuffed and transported in a police van without a seat belt. He sustained a "high-energy" spine injury while in police custody. Six officers were charged in connection with the death; three were acquitted in bench trials, and Mosby's office dropped the charges against the other three. In a passionate speech, Mosby said she's not anti-police — "I am anti-police brutality." Mosby said prosecuting officers is "fraught with systemic and inherent complications." She alleged that some officers were uncooperative and reluctant during the investigation into their colleagues, and called it "an inherent bias that is a direct result of when police police themselves." "This system is in need of reform when it comes to police accountability," she said. You can see Mosby's full remarks above, via CBS Baltimore. Gene Ryan, president of the Fraternal Order of Police Lodge 3 in Baltimore, called Mosby's comments "outrageous and uncalled for and simply untrue" in a statement on Wednesday afternoon. "The detectives assigned to the case conducted a very thorough investigation into the tragic death of Freddie Gray, but the state's attorney simply could not accept the evidence that was presented," he said.